The "younger crowd" at Jonathan's work put together a Happy Hour after work at Friends Bar & Grille in Newtown. We got there shortly before 6 and they were just getting a table together, and a small group was still there when we left at 8:30. The grand total was probably about 14, which was good. We had some good food. I adored the fries that accompanied my chicken parmigiana sandwich, but the chicken itself was very bland, and the sauce very runny. Jonathan went in on a pizza with Andrew, a thin crust cheesesteak pizza. I had a bite and it was quite good. The guys each had three pieces, so it must have been good, too! Jonathan and I also shared a crock of the french onion soup... the broth was good and there was plenty of cheese, but the presence of sesame seeds no the bread was an undesirable addition. They also have a lot of beers on tap, but we didn't have any. After dinner, we headed over to Shady Brook Farm to catch the local flavor on a Friday night. Little Big Thing was the performing band that evening, and we caught the last half-hour or so of their set. I can't say I was impressed, but they weren't bad. There were many children running around, mostly near the elaborate play structure that was setup. We got some of Uncle Dave's Ice Cream, which I highly recommend. Andrew had the mint chocolate chip and the billionaire chocolate (creamy chocolate), I had the Newman's Chocolate Dirt (creamy chocolate with crushed oreos or something similar), and Jonathan had an Orange Cream Milkshake (with extra cherries). All was fantastic, and the scoops are huge! Next time, however, we should go on a Thursday night, since they apparently have 94-cent ice cream cones!! Jonathan, Andrew, and I went to The Green Parrot (their website needs to be updated) in downtown Newtown on Friday night. It's "green" as in it's both an Irish place and they're really into environmentally-friendly and organic stuff. Andrew tried a couple of their beers (they have a very long list), I went with the Mangotini, and Jonathan had a Dreamsicle-like drink. Mine was very fruit punchy in the beginning, but got stronger in the end. Cocktails were overpriced. We started with the Philly Egg Rolls, which basically meant steak and cheese in an egg roll shell. They were very greasy, pretty tasty, and were about twice as much as they should have been. I wouldn't get them again, just because they were like $7.75 for four pieces. Jonathan and I shared the Fajita Burger (we had a late lunch trying the new boneless wings at Wendy's... buffalo and Asian flavors aren't that good), which I really enjoyed, but Jonathan would have preferred a less-done burger, LoL. The fries were very good, which excited me. Get a side of remoulade sauce. Andrew went with the French Dip, and felt it was pretty average. All in all, it was a neat place, worth trying again. Oh, but beware there's not a lot of parking, unless you want to valet with two sketchy-looking teenagers sitting on a curb. If you dine with me often, you know that Japanese is my favorite cuisine. I often choose it for my birthday, and Benihana was my favorite restaurant after I visited just once. Jonathan and I both enjoy hibachi grills, so it makes perfect sense that it didn't take long for us to hit up a local place - Arirang. We went last Thursday night with Andrew, and left with plenty of leftovers and smiles on our faces. A family of four shared our table, but since the two children were very young, they were busy and kept to themselves. Jay was our chef, and he was very good, and very entertaining. The ginger dressing on the salad was a bit odd, and the soup was rather plain. But everything else was fabulous! The shrimp appetizer was cooked just right, and Jay flipped pieces of squash into each person's mouth! We all went with the fried rice (about $3 extra), and it was among the best I've had. I had the shrimp and chicken (and will probably try the scallops next time! ), and both were delicious. Jonathan and Andrew did the chicken and steak, and Jonathan really enjoyed the steak. I had a bite, but of course I wasn't impressed, LoL. The veggies were good, particularly the mushrooms (which means something coming from me!). Bean sprouts came at the end of the meal, but weren't really seasoned. Tons were taken home, and the fresh strawberry ice cream was fantastic (Jonathan had green tea ice cream, which was very strong). It is priced like many other hibachi grills, but I'd say it was worth it. Arirang actually has a tavern side in addition to the hibachi tables, and we tried them out this past Tuesday. The sushi wasn't fresh, the gyoza was rather bland, but the side of fried rice was still tasty. Lessons learned: stick to the hibachi room, but go on Tuesday! Tuesdays are double-point days on the frequent-eater card, so in the future when we go there, it'll be on a Tuesday! We were spending the day in Philadelphia with my sister, and we headed over to the Reading Terminal Market for lunch. PS - IF YOU GO THERE, GET YOUR PARKING VALIDATED!! We walked around some (Sundays are not the day to go, since about 1/3 of the market is Pennsylvania Dutch and they don't sell on Sundays), bought some apple cider and pretzels, then headed over to Carmen's Famous Cheesesteaks (cash only) for lunch. Kyla had a regular, I had a chicken, and Jonathan got his with pepperoni. All were good, although I'm not a big fan of cheese(chicken)steaks without sauce... I find them a bit dry. 6 of us went to Orchid Bistro up on Wickham (in the old Pizza Gallery) on Tuesday night, and nobody was impressed. We were nearly the only ones there, arriving about 8:30pm. The sushi wasn't fresh, the summer rolls weren't the greatest, the teriyaki chicken wasn't anything spectacular (and included a plethora of mushrooms which weren't listed on the menu! ), but I can say that the ginger dressing on the salad was very good. Bottomline: avoid the place. On Saturday we were up in Steinhatchee, kayaking down the river, and checked out the new "music park" (at the new boat ramp across from the Dollar General) that night. The owner of the ramp/park plays guitar and harmonica, and he gathers a crowd for a few hours on Friday and Saturday nights (starting at 6pm). We went from 6:30-8pm or so, and tried out the food, too. Jonathan and I shared a cheeseburger ($6) and an Italian sausage ($4), with a coke ($1). Each meal came with chips, too. They were pretty good for the price. Jonathan and I were in Florida for a week in July. Tuesday evening, my brother, sister, and I went to dinner. 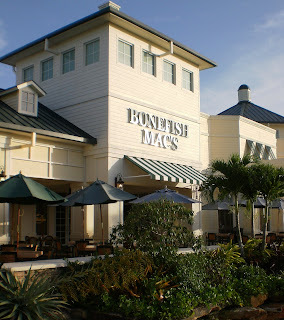 Jon (my brother) introduced us to a place off Becker Road called Bonefish Mac's. 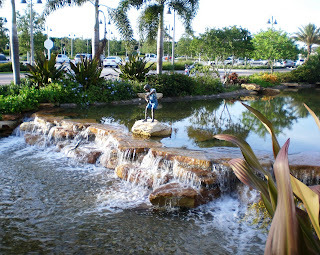 I was particularly amazed, since when I started driving (now more than a decade ago) there was absolutely nothing on Becker - it was just the quick way to get down to Martin County. Now, there's a few traffic lights and plazas and stuff. The menu at Bonefish Mac's is quite extensive. Given that it's a seafood place, I was really surprised at the amount of non-fish on the menu! We started off with the queso dip, and it was a smidge better than average. I went with the Drunken Sailor Pasta - penne and vodka sauce with scallops, shrimp, and mahi mahi. It was just okay... the caesar salad it came with was pretty good, though. I did take the leftover pasta home, and after adding mozzarella, it made a fantastic lunch the next day! Kyla had the Knuckle Sandwich, which was a burger on Texas Toast with ham and bacon. She felt it was okay. The fries were fine. Jon (who has had about half the menu it seems) went with a dish I don't really remember well... it was a sandwich that he wasn't in love with, though. The red potato salad was pretty blase as well. I wouldn't write off the place completely... I imagine that there's got to be some great stuff on the menu... the ambiance is nice enough!